While publishing’s been going through massive disruption over recent years, journalism has had its own problems. Ironically, in a world that runs on content, it’s harder than ever to be a professional journalist. So to succeed in journalism today, or indeed in any type of content creation, it’s not enough simply to write well: you have to develop an entrepreneurial capability, and part of that is developing and marketing your personal brand. In this week’s episode I talk about these changes with Sara Kelly, associate professor and chair of the Department of Journalism, Film and Entertainment Arts at the School of Professional Studies, the National University in San Diego, a former newspaper editor who’s also written two books, The Entrepreneurial Journalist’s Toolkit and Personal Branding for Entrepreneurial Journalists and Creative Professionals. Alison Jones: Hello and welcome to the Extraordinary Business Book Club. Today I’m here with Sara Kelly, who’s the associate professor and chair of the Department of Journalism, Film and Entertainment Arts at the School of Professional Studies, the National University in San Diego. She’s a former newspaper editor and she’s also written two books, The Entrepreneurial Journalist’s Toolkit, and the latest one, Personal Branding for Entrepreneurial Journalists and Creative Professionals. Welcome to the Club, Sara. Sara Kelly: Thank you. I’m happy to be here. Alison Jones: It’s great to have you here. I’m going to ask you about that phrase, “Entrepreneurial journalist.” It really caught my eye when I saw your book, but let’s just talk more broadly about journalism, which is obviously a very closely related field to publishing and writing which are, you know, my two areas. How has journalism changed in recent years and what’s that meant for journalists working in the industry? Sara Kelly: Well, everyone knows that newspapers, which most people once read many years ago, aren’t very well-read anymore, especially in the United States. It’s probably the same in England and in other countries, so those traditional journalism jobs have gone away for the most part. They still exist to some degree, but as the internet became more widespread and the economic models changed for journalism, people started looking for other kinds of jobs, other ways to make a living, and they really had to expand their skillsets. Probably about 10 years ago, there was a real push as journalism became converged for people, for journalists to learn multimedia skills, to start blogging, to learn video, all sorts of things, technical skills that they didn’t have to learn before. Now 10 years later, people have these skillsets that were unique and challenging and difficult for journalists to gain at the time. People can do rudimentary video editing. People do podcasting. People do all sorts of things, and that’s the expectation for a journalist today. It’s not special for a journalist to be able to do video. Everyone is expected to do it. They might not do it all well, but the expectation is there, so the question is now, 10 years later, as people who are in the field and are entering the field with these skills or are gaining these skills after having been in the field have to differentiate themselves somehow. If everyone does video, they can no longer be the journalist who does video. This really came about in coaching my students in how they were going to be employable, how they were going to maybe work for themselves, and how they would set themselves apart from everyone else who had all these different, wonderful skillsets that were not unique anymore. Alison Jones: It is galling, isn’t it? Because as you say, that was once a high value skill. It becomes commoditized because suddenly everybody is doing it. Sara Kelly: Well, it’s wonderful, but it’s also difficult to compete. Alison Jones: I suppose also with the gig economy. Journalists used to have a fairly straightforward business model. They would write content. They would work for hire. People would pay them and the newspaper would obviously pay, and have the money from the revenue from sales. It’s one of the ironies, I think, of the internet that there’s more content than ever before. I mean, it’s not that people aren’t reading newspapers. It’s just that they’re not paying to read them anymore, so everybody wants content, but nobody is prepared to pay for it. Sara Kelly: Exactly, and I don’t think it’s just exclusive to journalism. You mentioned the gig economy, which is a large part of the book. Even in my day job today, higher education, we talk about the Uberization of education, so more and more we’re thinking about how we can deliver directly what the people need, who our audiences are. Whether we’re teaching, whether we’re creating content, whether we’re traditional journalists, we increasingly have to go on our own, find out what people need, and cobble together an income, hopefully, from various sources. The nice thing is, people know that now. Young people getting into the field are expecting that. 10 years ago, there was a crisis as people, as young people who are getting into journalism saw these jobs going away because later that’s the expectation. People expect to have flexible careers. People expect to be able to work at home. People expect to do five different kinds of things, and that’s kind of the way society is going in general. Sara Kelly: Oh, definitely. People who are mid-career and beyond have the hardest time. Young people are flexible. They’re able to retrain. They’re not disappointed when traditional jobs aren’t there and that’s the good news. Alison Jones: Yeah. That phrase, “Entrepreneurial journalist” which, as I said, really caught my attention, and you couple it with creative professionals, which intrigued me as well. It’s quite a distinctive grouping. When I’m working with clients, we talk a lot about the target reader and being really clear about your niche. It struck me that I wouldn’t necessarily have thought to couple those two groups together, so just talk me through your thinking there. What is it that they have in common, how are they different, and did that kind of cause you any problems as you were writing and thinking about your target reader? Sara Kelly: Yeah, that’s a really good question and I understand what seems like a dichotomy, but it’s actually — in my mind, in my experience and in talking with students — pretty natural. People in my experience in higher ed and the students I work with … I teach business classes and journalism classes partly because that’s where the need is, but partly because journalism, to succeed in journalism today or any kind of content creation, you really have to be entrepreneurial, you have to business minded, and although I do have an MBA, that’s not my professional background. That’s not my experience, but I’m working with students in marketing and I’m finding that my experience as a journalist promoting my own work, doing my own projects is really coming in handy and it’s relevant not necessarily for all students, but for a lot of students I work with who are … I work with mostly non-traditional older students. A lot of them are working professionals. They’re military veterans. They have sidelines. They have businesses that they’re trying to start. They’re doing all sorts of things that require them to promote and market what they’re doing, so there’s a lot of carryover and I started seeing journalists and people from other fields who are … a number of people I know are working or have created documentaries, documentary films. They’ve done their own fundraising. They’ve done their own promotion and marketing. I did one a year ago. I mean, the barriers are down, so you find, I’m finding that with the ability to create and promote and distribute content of all kinds, now that those barriers are down, people from journalism and other fields are working together. They’re finding ways to collaborate, to raise money, to distribute content, and it’s really the convergence model. We talked about journalism convergence 10 or 15 years ago, and that was mind-blowing for journalists. It was the idea that, “Oh, we can have a website. We can have video on the web. We can have writing on the web. We can do all these different things,” but now it’s all kinds of job convergences. I mean, as people do a little bit here and little bit there, and a side project here and teaching there, there’s really more shared creativity and it’s very project-based from what I see. It’s exciting because I think it’s freed people up to do more creative things. There are more opportunities out there and I think most people, regardless of the field, love the idea of being creative and putting content out there, things that seemed impossible in the past: writing a book, blogging, producing a documentary. Things that were not possible before are now possible and I think that’s opening doors for people in ways that they were not able to even conceive of in the past. Of course, the problem is trying to make sure that you have enough income to actually support yourself through these various projects. Alison Jones: Yes, you have to be much more creative and thinking, “Okay, who’s prepared to pay for this and what other forms of revenue can I generate through partnerships or sponsorships?” We know all that kind of good stuff that people are discovering. It strikes me as well that you talked earlier about journalists scaling up in different ways and the challenges facing them. In a sense also, we’re all becoming our own journalists as well, aren’t we? I know the journalistic skills are becoming more and more required by anybody who’s in business. They’re all in the business of communicating. Sara Kelly: Oh, definitely. I see this in higher ed too as the move … There’s a move toward more specialised education where people are creating their own paths because these discrete job paths in many fields aren’t discrete anymore. People have to be generalists. People have to promote themselves. They have to be entrepreneurial in fields like business, and in journalism, communication. You know, unless you’re a heart surgeon, you’re probably out there thinking about what you’re going to be doing next. Alison Jones: Let’s talk about the personal brand as part of that because you say we’re all responsible for promoting ourselves, we’re all responsible for building that brand. What are the key skills, the techniques, the practises that enable people to build a personal brand in the digital world particularly, and why does a personal brand matter at all? 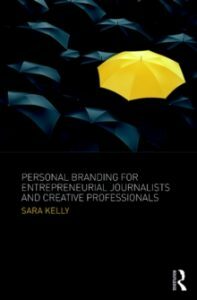 Sara Kelly: The personal brand is important, as you know and a lot of young people know. It’s natural to them these days. That’s the way they present themselves to the world. That’s how they differentiate themselves in their skills. That’s how they get work. That’s how they create a reputation that will hopefully serve them well in their future career, so the brand is really important in a world where millions of people can do millions of wonderful things, so what sets you apart? What’s important to the brand is, there are some real basic things and that is being on it all the time. You have to have a presence all the time. You can’t disappear for two weeks and then come back, and expect your audience or your community that you’re a curator, you create, to still be there, so there has to be consistency. You have to be interactive. Social media platforms in recent years have changed algorithms to promote interactivity so that there’s an authentic that might have been lacking in the past. As we get more activity and commercial activity on social media, actual authentic communications and interactivity is at a premium, so people who are responsive, people who create a personality for themselves that is authentic, and show themselves not as bots or as cold, corporate entities are really at an advantage. Coming across as a human being instead of a bot, forming a community of people who are interested in what you’re talking about or that you have something to offer them is very important today because that community is what creates your audience, and the audience is what is marketable. It’s what can lead to people who buy your books, people who listen to your podcasts, anything like that. If you’re not a known entity, you’re just going to disappear among millions of other people who have the same skillsets. Alison Jones: That’s so interesting because I think when a lot of people hear the word brand, they think graphic design, logo, but actually everything you just talked about is about relationships. It’s about being yourself and interacting with other people on the web consistently and authentically, which to me feels a much more rich definition of personal branding than just having a nice consistent logo and colours. Alison Jones: I love that. It’s bringing us back to the humanness, yes. It becomes transparent, doesn’t it? You start focusing on the wheeziness and just get back to what really matters. I love that. I want to talk about your writing as well because you’re in that really interesting space. I love working with people in this space where they’re between the professional and the academic. You know, the pracademic space. What’s on your mind when you come to write a book? Because on the one hand, you’ve got the kind of traditional academic, scholarly drivers about tenure and reputational rest of it, but on the other hand, you really are producing practical books for people, aren’t you? How do your books fit professionally and personally into the other stuff that you do? Sara Kelly: Happily I’m in the school professional studies, so I’m in a slightly less academic track. Having come from the professional world, coming from journalism, makes me not kind of a dyed-in-the-wool academic. I’ve always been very practical. I mean, journalism teaches you to do that, to think about being as direct and clear and straightforward as you possibly can, and delivering needed information to the people who want to hear it or want to see it. I just have a hard time producing anything that’s not relevant and practical. Alison Jones: That’s no good. You’re supposed to after that because you have to obfuscate. Sara Kelly: I know. I have very little tolerance for academic and scholarly writing, and I think people who like it, either they’re lying or they’re seeing something that I’m not, but I don’t have the attention span to read something that’s impenetrable on purpose. Alison Jones: That’s so funny, but you’re right. It is about exclusion, isn’t it? It’s about putting the jargon in so that most people won’t understand it, which by definition puts you in a very elite in crowd, I suppose. Alison Jones: Taylor and Francis obviously felt the same. They’re also published by Routledge, aren’t they? Routledge is an academic publisher, but also with a professional thing. Is there pressure to write in a more or less academic way, or do they completely get sort of where you’re aiming? Sara Kelly: They seem to completely get where I’m aiming. The editors I’ve worked with, two different editors for the different books, and they’ve both been very respectful of my vision. The process has been a little bit different and I think that’s been probably because of the nature of the changing book industry. In general, other people I know, who’ve written books in other fields, experience similar things. It was very hands-off. I mean, the editors were there when I needed them, but I think they trust their writers. They trust the people who are creating content. Of course, I did develop pitches and outlines and pretty extensive proposals for each book, with some suggestions and some tips and some back and forth. Aside from that, it’s pretty much my vision. Nobody told me to do something differently, which was a little scary and also pretty great. Alison Jones: You don’t know if … nobody is actually commenting on this, or actually it’s all fine and you should just crack on. Sara Kelly: Well, that’s kind of the nature, I think, of the world, the working world these days. We’re moving so fast, especially in fields like communication and business. Things are happening so quickly and the editor for this book, this book that’s coming out — the branding book — wanted to get it out quickly, and for good reason because the world changes so quickly, so there wasn’t a lot of time to go around and around and around on ideas. We wanted to get it out there and I think that’s pretty much the nature of publishing and all kinds of content creation these days. You know, gone are the days where you’d anguish over tiny edits. I remember fact-checking for days in newsrooms, and now stories go out there on the web and they’re changed later. If there’s a problem, you go in. You can’t do that with a book, unfortunately. Alison Jones: No, you can’t, and it’s a really good point because I think it’s been a crisis in publishing is, “Okay, what is the book for?” Where you have this whole expectation of things being up to date and updated within minutes of things happening. I was the editor of The Statesman’s Yearbook, which was an annual library reference product, and by the time it went to press, it was out of data. You’d be updating on a kind of rolling cycle, but just the whole … Of course, by the time it arrived in the shops, it’s a big decision that you make as to how quickly you produce something, how accurate it is, and how often you update it. I think publishers really do continually struggle with that and are finding interesting new ways of doing it as well, so The Statesman’s Yearbook obviously went online because that was the natural home for it, but what I think is happening is that you are seeing things that are happening online, conversations that are happening online expressed in deep dive form and kind of long form in books in more discursive rich ways. It’s almost finding a kind of new place in the ecosystem. Sara Kelly: I think you’re absolutely right. The formats are changing and that was the panic when newspapers started going away. People worried. Journalists thought, “I will never be able to work again,” but now it’s doesn’t matter increasingly, even with books. We have e-books. We have Kindle. We have various different forms that we can read books in these days and other content that we have to get away from the idea that the format of whatever we’re consuming is that important. I mean, we see this with TV, and streaming video versus cable TV and the traditional ways that we would get broadcast media. It doesn’t matter anymore how you get your content. Alison Jones: You can look at a subject as a writer across lots of different touchpoints, which I think is quite important as well, so it’s no longer enough just to write a book. You have to be putting your content out. As you say, you’re curating a brand on social media and hosting the communities and blogging and all that other more immediate forms of content as well, don’t you? Sara Kelly: Oh, yeah. It can be exhausting, but I think the good news is that we found … I remember 10, 15 years ago, I remember working in the newsroom and my boss said, “Podcasts are dead.” 10 years ago. He said, “Oh, they’re never going to work out.” I think they’re stronger than ever and the thought was that nobody is going to listen for more than a minute or two minutes, but it’s a whole new medium where people will listen for three hours. You know, they’ll have it on in the background when they’re working on a project or whatever. We’ve seen things that we never even dreamed of years ago, so that’s really good news. Alison Jones: Yeah. I think audio is such a friendly format because you can listen to … I listen to other people’s podcasts when I’m out on my long runs or in the car. It’s a much less demanding medium than video, isn’t it? Which demands all your attention all the time. Sara Kelly: Yeah, and often times you don’t need to be looking at the video. Sara Kelly: If somebody is talking or if somebody is being interviewed, you really don’t need to look at them most of the time. Alison Jones: That can be really distracting. Alison Jones: Why are they doing that annoying thing? There’s going to be a lot of people listening who are in the throes of writing their first book. What wisdom can you give them? What’s your sort of best tip for somebody who’s struggling with writing a book about their own expertise and communicating that effectively? Sara Kelly: I think living with the idea for a while is a really good idea. I think the branding book was in my head for several months before I even knew that I was going to do anything with it. You mentioned running on a long run, that sort of thing: going to the gym, running, just letting those ideas flow, and then really focus on getting a solid idea before you worry too much about where you’re going to shop it because I think these days in particular, there are markets for really good ideas. Even with this book you had mentioned, this is kind of a weird mix of things. It doesn’t seem to fit it. Alison Jones: Yeah, not so much. Sara Kelly: Not my case. Not my case, so it has to be really a labour of love, but I think that the gatekeepers are down for the most part and there’s more possibility that you can publish anything these days because you don’t have to ensure that you’re going to be able to sell millions of copies. I think a book publisher can sell a relatively small number of copies and then see how they go, and so the risks are low and I think that makes it easier to take risks on unknown books or authors. Alison Jones: I think that’s a really interesting point, and of course that’s really driven by print technology because with print-on-demand, digital printing, you can do a short run of 300, 400 copies. You don’t have to pay for warehousing. You don’t have to take a punt on printing 1,000 and shipping them around the world, and then pulping them a year later. There’s lots of disruption in publishing, but one of the most fundamental the nobody really talks about is actually the print production stuff and that’s what’s been driving a lot of … it drives the costs down, it drives the risks down. As you say, it means that people can take punts on things that might work or might not, frankly. Alison Jones: Yeah. It’s really interesting. Thank you. I always ask my guests to recommend another guest on to the show, which is always a really interesting thing because it takes me well beyond my immediate network, which I love, so who would you suggest would be an interesting person to talk to on the show, somebody with something interesting to say about writing, about business books, about publishing, about content in general? Sara Kelly: Two of the authors that I really examined and went back to when researching this book, they’re very big picture thinkers, one is Richard Florida who has a brand new book out. He was well-known for The Rise of The Creative Class, which came out many years ago. The themes that he has identified, some of them came to fruition and some of them are lot different than he anticipated that they would be 15 or more years ago. He looks at big picture issues. I think business is interspersed throughout all of these topics. Urban environments, creative cities, the future of jobs, healthy communities based on not just income, but what kinds of work people do, the health of communities, the coherence of communities, how well they live together, how diverse they are. This is definitely a concern these days politically, economically. Richard Florida takes that big picture look that is relevant from a business perspective. It’s relevant from an urban planning perspectives. It’s just fascinating read, so Richard Florida, I would definitely recommend. The other one who I went back to, and he’s written since, but the very popular and influential book, The World Is Flat, was written many years ago by Thomas Friedman. This was in the earlier days of the internet and a lot of what he wrote about back then is no surprise today. The fact that the internet has globalised business, has globalised cultures and economies in ways that we’re very used to these days, but it’s fascinating to see what his predictions were for where we are now in a business sense, and also how the internet has really changed things. We see trends developing that started back 15 years ago, the idea of mechanising jobs, the idea that a large percentage of the jobs that we have in the developed world are going to be taken over by robots or can be done by robots on the future. Those kinds of big picture thinking oriented books are really relevant across different fields, and they’re inspirational to me. I think making those connexions between the fields, business or writing and content creation, it’s all important. It’s all relevant, so I would recommend Thomas Friedman and Richard Florida. Sara Kelly: I heard Richard Florida on an interview on Public Radio not too long ago and he was talking about exactly that, like things that he got wrong, and having to change some of his latest book in light of what happened politically in the fall of 2016 when he was expecting one president and one party to win, and then something else happened completely, so he had to rethink a few things. Alison Jones: Sometimes you put the money on the wrong horse, yeah. Alison Jones: That’s so interesting. Thank you so much, Sara. Now if people want to find out more about you and more about the book, where should they go? Alison Jones: Right. By the time this comes out the book will be published, so I’ll put the link, the Amazon link maybe or the Routledge link up on the show notes and people can find it that way. Fascinating. Absolutely. It’s very wide ranging, but I love the way that we’ve brought together those themes of the way that work is changing, the way that people’s skills are changing, the whole economy, right down to the nuts and bolts of the writing, so thank you. That was really interesting. Sara Kelly: Well, thanks. I hope it was helpful. books, brand, entrepreneurship, journalism, publishing, writing. Bookmark.